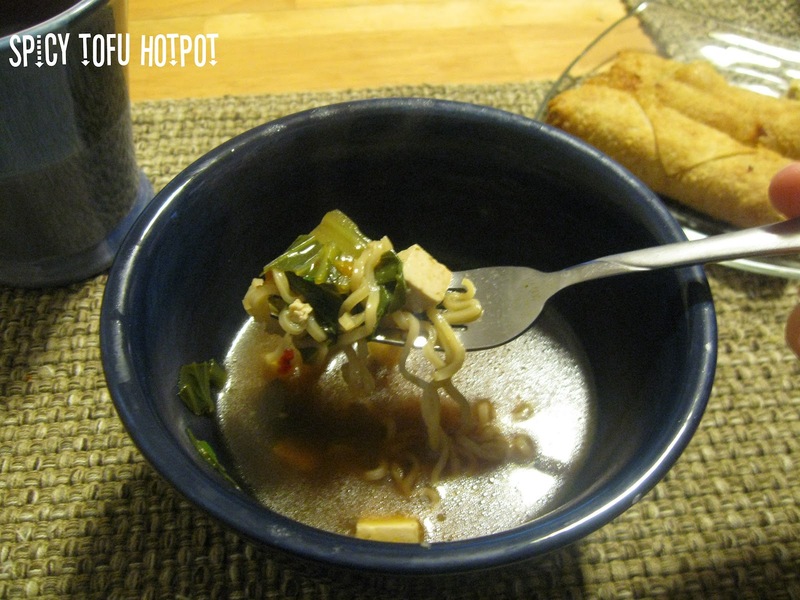 Hotpot is quick, easy, and relatively cheap to throw together. The great thing is that of course you can change anything want in it, like using shrimp instead of tofu (or chicken or pork). We just use white button mushrooms but you could also use shitake or another fun type. We also just use ramen noodles and throw away the packet but you could use actual lo mein noodles or even soba noodles probably. Another change is we add way more chile-garlic sauce than 2 teaspoons because we like it hot :) It's so good even my three year old likes it, which surprised me as well! Heat oil in a Dutch oven over medium heat. Add ginger and garlic; cook, stirring, until fragrant, about 1 minute. Add mushrooms and cook until slightly soft, 2 to 3 minutes. Stir in sugar, broth, soy sauce and chile-garlic sauce; cover and bring to a boil. Add bok choy and tofu, cover and simmer until greens are wilted, about 2 minutes. Raise heat to high and add the noodles, pushing them down into the broth. Cook, covered, until the noodles are tender, 2 to 3 minutes. Remove from the heat and stir in cilantro.